Diario Judío México - Languages convey the flavors of culture and tell us so much about history. As words fill songs and poetry, letters, plays, and children’s tales, they give shape, color, and contour to a society. Some languages thrive, morph, and even overtake other dialects in a region. Others, like Judeo-Spanish , peter out and over time, become like embers holding onto just a few small sparks of life. Ladino is a Judeo Spanish language that traveled on the tongues of the Jews who were expelled from Spain in 1492 and then settled in the many countries that made up the Ottoman Empire. While today very few people speak the language, there are many who still use Judeo-Spanish phrases, have Judeo-Spanish names, retell Judeo-Spanish stories, and sing Judeo-Spanish songs. Second to grace the audience was one of the organizers and presenters, Dr. Bryan Kirschen, a linguist and professor at Binghamton University. He spoke about his experience traveling around America in search of Judeo-Spanish speakers. He discussed the challenges in determining what it means to be a speaker of Judeo-Spanish in the 21st century. On Sunday, February 10th at The Center for Jewish History in Manhattan, The American Sephardi Federation in conjunction with The American Jewish Historical Society, The Sephardic Jewish Brotherhood of America, and Binghamton University Judaic Studies Department held an event to celebrate and fan the flames of the rich Judeo Spanyol tradition. Over three hundred people filled the auditorium and spilled out to extra hallway seating, as they watched and listened to linguists, storytellers, and musicians share their talents. When Dr. Mushabec heard that Judeo-Spanish Day festivals were taking place in Jerusalem, Istanbul, Madrid, Seattle, and Boston after a woman named Zelda Ovadia, on an internet chat room called Ladinokomunita, suggested a worldwide Judeo-Spanish celebration in 2013, she immediately approached ASF and AJHS to make a program in New York City, home to the largest number of Sephardic Jews in the US. Second to grace the audience was one of the organizers and presenters, Dr. Bryan Kirschen, a linguist and professor at Binghamton University. He spoke about his experience traveling around America in search of Judeo-Spanish speakers. He discussed the challenges in determining what it means to be a speaker Judeo-Spanish in the 21st century. While some remain fluent, others retain more of a passive knowledge. This was the case for Shelly Morrison, an actress known for her work in the TV series Will and Grace, who recounted the Sephardic names of family members, from Tanti Roza to Madam Dudú. One of the moments Dr. Kirschen enjoyed most during the day was seeing about 30 hands go up when he asked how many in the audience speak Judeo-Spanish. 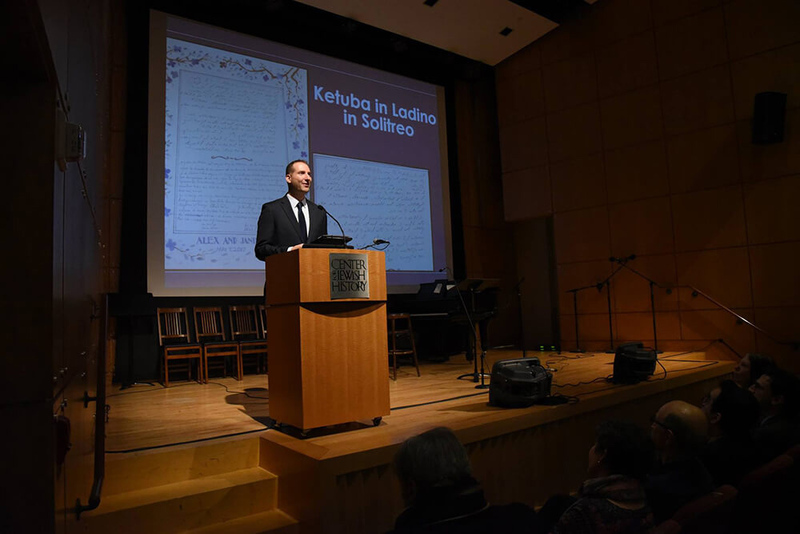 It is a question he plans to repeat at the next Judeo-Spanish Day on Sunday, May 5, 2019, at The Sephardic Jewish Center in Forest Hills.